Last week we stopped off in the Marvel Universe for a fun trip down memory lane. Today’s destination promises to be fairly exciting, even though it is a voyage forward rather than backward in time. Once again we return to the Federation of Planets for another adventure aboard the famous U.S.S. Enterprise, readers! Aboard Sigma One, a space station a few days from the Federation/Orion border, Captain Kirk has gone out to dinner. Scotty and McCoy have whisked him off to a Scottish restaurant aboard the station in order to help him unwind. For the past three days, which were supposed to be used for shore leave by the crew, the men and women aboard the Enterprise have been pestered almost to death by four auditors from the Auditor General. It seems the Auditor General has teams of auditors surprising starships throughout the fleet with on-site inspections. For the last three days the crew of the Enterprise has been running efficiency drills to prove they are following the regulations properly and can react to a stiuation as fast as possible, with the clipboard-wielding inspectors looking over their shoulders the whole time. In the process these four individuals have, unsurprisingly, made themselves an enormous nuisance to the crew. This has put everyone aboard the ship on edge, meaning those who can grab shore leave are not letting it pass them by for any money. While Scotty and McCoy help Kirk relax, Chekov has convinced Sulu to help him try and beat a record set by another ship’s crew on the station’s piloting simulator. After failing the simulator’s sixth level, the door opens automatically, allowing Uhura to ask how much longer the two men plan to continue playing. Sulu answers the question by getting out before Chekov can reactive the machine. He then leads his two best friends to a plant shop he has already visited three times so far. On the way there the three bump in to some Orion police officers in riot gear. Since they are out of uniform, the men merely push past them instead of goading the Starfleet officers into a fight. Not long after they enter the plant shop, however, an Orion policeman comes to “inspect” the premises for something/someone. His “inspection” consists mostly of wrecking the store owner’s property. This infuriates the businessman, who attacks the alien with a broom. Chekov and Sulu intervene on the man’s behalf after he is tossed across the room, earning the latter a free gift of plants, pets, and the lily pond they need to survive and be happy. Unfortunately, Chekov’s gift is entirely different; the Orions cast his actions as assault, leading Sigma One’s security forces to throw him in the station’s brig. Meanwhile Kirk, Scotty, and McCoy’s relaxtion proves to be premature. Like a troubadour leading his not-so-merry band, the head auditor arrives at the restaurant, fuming about being barred from the Enterprise. Kirk is sanguine until he learns that he has new orders to go to the Andorian/Orion border – with the inspectors in tow. Tense once more, Kirk goes to speak to the commodore in charge of the station, a friend whom he helped to promote to his current position. The commodore explains that since an Andorian scientist named Muav Haslev – who was developing some kind of technology for the Andorian military – disappeared from their space, the Andorians have blamed the Orions for the incident. The Orions claim they had nothing to do with his vanishing act, but no one believes them. And even without definitive proof, the Andorians are spoiling to pick a fight with the Orions. The sector between the two is heating up and threatening to embroil the Federation in a war with Orion, which is a neutral stellar nation. Kirk is fine with this part of the assignment; he has done this kind of thing before, and knows how to handle it. His problem is the auditors. While traveling to the Andorian/Orion border is dangerous enough for him and his crew the way things stand now, taking four civilians (one of whom is extremely annoying and has a superiority complex) into a possible war zone isn’t his idea of a smart move. But as he soon learns, neither assignment is negotiable. The ship that was supposed to take the auditors next and deal with the Orion/Andorian issue at the same time recently suffered a containment breach of its warp core. Though the damage could have been much worse, it is bad enough; the vessel may never be spaceworthy again. She’s barely able to limp to Sigma One with the help of tug shuttles. This leaves Enterprise to carry out the mission – exasperating auditors and all. Once Chekov gets out of the brig and boards the Enterprise with Sulu and Uhura, the ship heads for the border…. …Only to be struck by a burst of radiation that sends her instruments haywire. Sulu just barely manages to keep the starship from warping straight through Sigma One after the radiation scrambles the helm. The computer turned the Enterprise back toward the station thinking it is open space. Returning to their normal course, the Enterprise gets under way at last, only to be intercepted a short time later by a disguised Orion destroyer. Following on its heels is an Orion police cruiser, whosse captain is intent on arresting Chekov for the incident back at the station. Upon learning the details of the confrontation on Sigma One, Kirk realizes the Orions set him up to get his security officer. After a brief word with the Orion commander, he has the Enterprise continue on to the border. …Not for me to tell! If you want to know how Death Count ends, you will have to read it yourself. It is a good book, but unlike most L. A. Graf novels, it doesn’t include Uhura’s direct perspective of events. 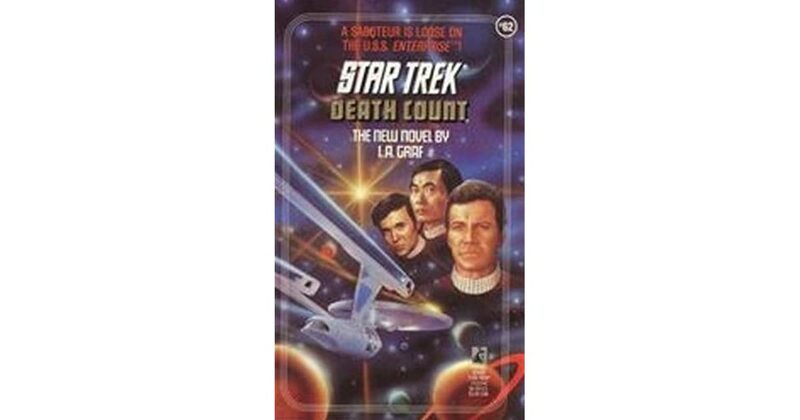 The three points-of-view explored in this novel belong to Sulu, Chekov, and Kirk. That is a fairly unusual choice for L.A. Graf. 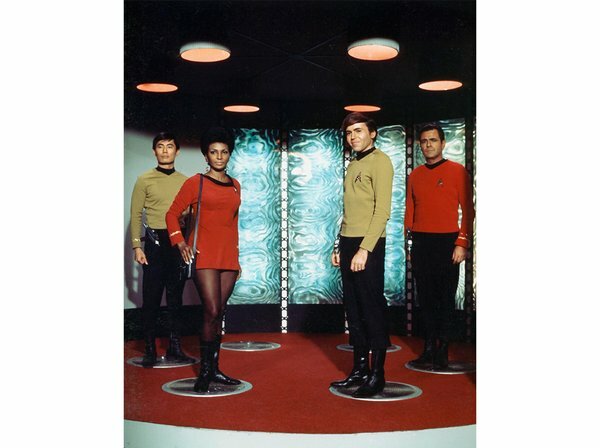 Normally, the writers using this pan name include Uhura’s viewpoint along with Sulu’s and Chekov’s to explore their characters, while giving fans a view of life from “below decks.” Kirk’s POV is included to show how he regards the three younger members of the “Enterprise Seven” as officers and people. For some reason, Death Count breaks this pattern. While it is not irritating or a loss in any sense of the word, it does make one wonder. I only note it for the curious and for those L.A. Graf fans who have not managed to acquire this story yet. This entry was posted in Book Reviews and tagged Andor, Andorians, Book Reviews, books, Captain James T. Kirk, Commander Spock, Dr. McCoy, Ensign Pavel Chekov, Enterprise, Enterprise Seven, L. A. Graf, Lieutenant Hikaru Sulu, Lieutenant Uhura, Montgomery Scott, Mr. Spock, murder mysteries, mystery, Nyota Uhura, Orion, Orions, Scotty, Spock, Star Trek, Star Trek: Death Count, Starfleet, U.S.S. Enterprise, United Federation of Planets, Vulcans on March 22, 2019 by The Mithril Guardian. Well, we have been to the Witch World, Newfoundland, and a toy castle from England. Let’s see what is going on in the United Federation of Planets, shall we? I gave this book as a gift to a friend, so I do not have a copy of it with me as a reference. Please forgive me if I mess up some of the details, readers. 😉 The novel, written by the ladies who use the pen name L. A. Graf – “Let’s All Get Rich And Famous!” – takes place in the interim between the end of the original series and Star Trek: The Motion Picture. Kirk has become an Admiral some time before this book starts; McCoy is enjoying being a crotchety, grounded Earth doctor; Spock is away on Vulcan, and Scotty is aboard the Enterprise, which has been docked in orbit for a refit. Meanwhile, Sulu is working as a test pilot for a new shuttle with a cloaking shield in White Sands, Arizona. The project is top secret, but he has told his best friends – Uhura and Chekov – all about it anyway. After all, if they cannot keep a secret, who can? At the same time, Uhura is teaching a communications class at Starfleet Academy and Chekov is going to the Security Academy in Annapolis, Maryland. Of the three Chekov has, as usual, gotten the short end of the stick. He wants to be a Security Officer so he can gain the experience he needs to enter the Officers’ Academy which Kirk attended. Kirk was admitted to this school at a young age because he was a special case. Chekov is special, too, of course, but the guys in charge have deemed him too immature to enter the school at this time. This has stung his pride so badly that he has decided Security is the only place to gain maturity. Unfortunately for Chekov, one of his classmates absolutely hates him. This man’s name is Leong, and he has been in Security for quite some time. He thinks all Starfleet officers are flash and splash; that they do not have the mettle to take on real threats. Because Chekov is not as graceful or fast as he is, Leong can outmaneuver and whip him easily in practice fights. There is nothing wrong with Chekov, who has faced worse opponents in deep space and lived to tell the tale. It is simply that he cannot keep up with Leong when it comes to speed. Chekov does not see it that way, though, probably due to a combination of the Officers’ Academy’s vitriolic rejection letter and his natural Russian pessimism. He rarely has any fun at the Security Academy, and he has almost no friends there. The only bright points in the whole mess are the occasional dinners he has with Uhura and Sulu when they leave their much nicer jobs out west to visit him on the weekends. Then they all get to sit down, reminisce, and relax at a nice diner, restaurant, or café somewhere in Annapolis. The latest dinner includes McCoy and Dr. Piper, the physician for the Enterprise before Kirk took command. The dinner is merrier than ever, and Chekov gets an offer from Dr. Piper he cannot refuse. Dr. Piper is working on finding a way to treat injuries caused by Klingon disruptors. The problem is, no one at Johns Hopkins University knows how to fire the one disruptor they have. Starfleet officers who have faced Klingons in combat are not exactly lining up at the door to shoot it, either. Knowing how bad a disruptor injury can be, Chekov jumps at the chance to help. It is only later that Piper confides in Chekov the real reason he wanted to hire the ensign: he thinks a traitor in Starfleet is trying to steal the disruptor. Afraid to trust anyone at the University, since those attached to the project might be compromised, he hired Chekov because he served under Kirk aboard the Enterprise. If Kirk trusts him, that’s good enough for Piper. Unfortunately, as Chekov learns too late, Piper is right about those attached to the disruptor project being compromised. Unable to get to Dr. Piper in time to save him and, robbed of the recordings proving what actually happened, Chekov ends up on the run from the authorities after he is accused of killing Dr. Piper. Though Uhura and Sulu know this is not true, Starfleet’s top helmsman soon has other things to worry about. The plans for his stealth shuttle have been copied and stolen, and the Navajo engineer helping him to test the shuttle has gone missing. The engineer is blamed for the theft, naturally, but Sulu finds this hard to believe. His faith in his friend is rewarded when he is testing the shuttle some days later. During the test flight Sulu finds a message from the engineer embedded in the shuttle’s systems. Through the message, the engineer warns him that someone in Starfleet has turned traitor and stolen the plans in such a way that either the engineer or Sulu would take the blame. To take the heat off of Sulu, the engineer ran off and hid in a place only the Navajo can find. He left the message because he wants Sulu to know someone is out to get him. And Sulu has a feeling he is not the only target. The theft of the plans, the disappearance of the disruptor, and now Chekov’s supposed murder of Dr. Piper have happened too close together to be coincidence. They were both senior officers aboard the Enterprise, so whoever the traitor is, Sulu can only assume that he is trying to black Admiral Kirk’s name by framing him and Chekov for treason. 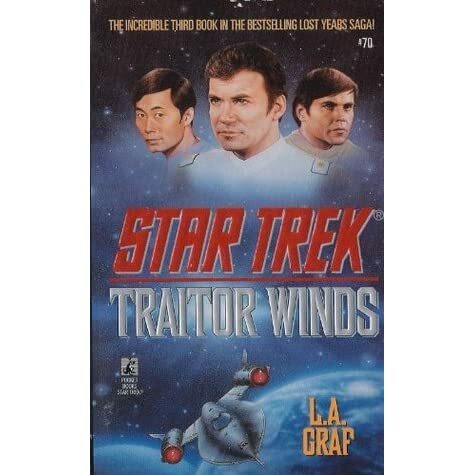 Star Trek: Traitor Winds is a good standalone Trek novel. It rotates through the POVs of Uhura, Sulu, Chekov, and Kirk. Spock is the only member of the Enterprise Seven absent from the story, while Christine Chapel and Janet Rand get guest appearances. As a high stakes race to the finish, Traitor Winds is one of the best. Engage that warp drive of yours, readers, and search this novel out. It is worth the read! This entry was posted in Book Reviews and tagged Aliens, Book Reviews, books, Captain James T. Kirk, DeForest Kelley, Dr. McCoy, Ensign Pavel Chekov, Enterprise, Enterprise Seven, Gene Roddenberry, George Takei, James Doohan, Klingons, L. A. Graf, Leonard Nimoy, Lieutenant Hikaru Sulu, Lieutenant Uhura, Montgomery Scott, Mr. Spock, Nichelle Nichols, Nyota Uhura, Pavel Chekov, sci-fi books, sci-fi novels, Science Fiction, Scotty, Security, Spock, Star Trek, Star Trek: Traitor Winds, Starfleet, Sulu, U.S.S. Enterprise, United Federation of Planets, Vulcan, Walter Koenig, William Shatner on July 14, 2017 by The Mithril Guardian. This entry was posted in Quotes and tagged Charlton Heston, Dean Koontz, Francesca Battistelli, John Wayne, Montgomery Scott, Obi-Wan Kenobi, Quotable Quotes, Quotes, Scotty, Star Trek The Original Series, Star Wars, Star Wars Episode IV: A New Hope, Unpredictable on July 10, 2016 by The Mithril Guardian. With all my focus on Marvel Comics lately, I have let a few of my other favorite stories go by the wayside. (What do you mean, Mithril? You have all but ignored them! Insert eye-roll here.) A while ago, I wanted something light to read, so I went to my bookcase, pulled a volume from the shelf, and read it. That book was Star Trek: The Janus Gate – Past Prologue by L. A. Graf. The Janus Gate trilogy, made up of Present Tense, Future Imperfect, and Past Prologue, takes place after the first season episode The Naked Time. In that episode, the Enterprise landing party is infected by a virus which killed a Starfleet research crew on planet Psi 2000. The virus makes those who receive it go mad; sometimes by releasing rage and psychopathic fury, sometimes by making the person go “La, la, la!” and doing crazy things, such as showering in sub zero temperatures with their clothes on. Depends on the person who gets it. The book trilogy picks up at the end of this episode when, to escape the dying planet, the Enterprise is sent hurtling three days back in time. Since going on to their next assignment while the Enterprise is technically headed to Psi 2000 (the dying planet) would completely muck up the time stream, Kirk decides to take the Enterprise back to a different planet, where he had left three research teams before going on to Psi 2000. Before I go any further, I must warn you that Star Trek books, or some of them, have no bearing on the original TV show/original film timeline. They are, as fans like to say, non-canon stories which were written to amuse the fans and the writers. After all, the Enterprise in the original TV series is supposed to be on a five year deep space mission. CBS, the TV station which produced and showed Star Trek in the 1960s, hated the series and tried to kill it after two seasons. That did not work, as Star Trek fans flooded the studio with letters demanding that the series remain on the air. CBS relented long enough to allow a third season of Star Trek, but they cut the show’s funding so much that the special effects for season three were very poor. Star Trek did not return for a fourth season. But that is not where the story ends. CBS prevented Star Trek from carrying on beyond three seasons, true, but the series has never been off the air since it was killed. Though finding the reruns on TV now is next to impossible (for me, anyway), I can recall when the original Star Trek series would play on TV. For an unsyndicated series – that is, a TV series with less than a hundred episodes – to remain on television for as long as Star Trek has is amazing. In the 1960s and even today, TV shows in the U.S. are not rerun on television unless they are syndicated – that is, unless they have a hundred episodes or more. Star Trek, and now Joss Whedon’s series Firefly, are enormous exceptions to this rule. This is the reason – or one of the reasons – for all the original Star Trek novels. We Trekkers and Trekkies like our original series too much to let anyone kill it, and if no one is going to tell the stories we want to hear, then we will tell ‘em ourselves. Preferably while being paid bucket loads of money to do it, but only a few lucky people actually manage to get that. Someone in the publishing department messed up when they printed The Janus Gate trilogy, because the blurbs on the backs of books one and three – Present Tense and Past Prologue – describe the wrong story and refer to actual Star Trek episodes from the original series. The blurb on the back of book two, Future Imperfect, is mostly accurate. With these digressions out of the way, we can now get back to business. 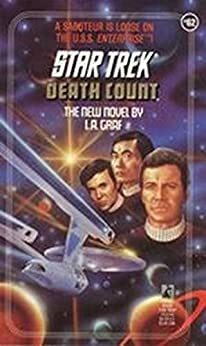 L. A. Graf books always focus on the three “lower level” officers from the Original Star Trek series: Lieutenant Nyota Uhura, Lieutenant Hikaru Sulu, and Ensign Pavel Chekov. This is part of the reason I enjoy L. A. Graf’s books so much. I do have other favorite fan fiction novels for Star Trek, of course. L. A. Graf books, though, are the ones I keep my eyes peeled for. The Janus Gate fits into L. A. Graf’s modus operandi, focusing mainly on Uhura, Sulu, and Chekov, though Kirk gets very good “screen time,” too. That is always a plus! The first book of The Janus Gate trilogy, Present Tense, picks up immediately after the events of The Naked Time. Kirk brings the Enterprise to the barren planet Tlaoli 4, where he left three research teams before going on to Psi 2000. Contacting the lead team, Kirk finds out that Team Three went spelunking – against orders – and has been missing for several hours. Kirk also learns from Team One that the reason they broke with his orders was because they found the wrecks of at least nineteen starships buried in Tlaoli’s scoured surface. Afraid the Enterprise could suffer the same fate, Team One sent Team Three to investigate nearby caves where something was draining the research teams’ power from their equipment, and even from their shuttlecraft! With the power drain likely stranding Team Three in the caves, Kirk decides to move in and rescue his people, sending down a landing party from the Enterprise. He also orders “primitive” equipment such as chemical batteries and carbide lamps to be sent along with the rescue team, so they at least have light and an alternate source of power for their phasers, communicators, et al. Kirk will lead the team, and he calls on several others to join him. The people he wants are short, so that they can fit into the caves’ tight spaces. That lands Uhura on his spelunking team, and Chekov ends up in the landing party because he knows how to make maps by hand. Once in the caves on Tlaoli, Kirk’s team cannot find the research team. Finally, the spelunker on Kirk’s team, Zap Sanner, figures out where the leader of Team Three would have gone. He does this after Kirk and the others’ use of their phasers to light the dark caverns so he can see more of the cave system. Kirk, who was next in line down the ladder, goes to rescue the Russian kid. He drops down the crevasse and lands in icy water, having forgotten it was there. Swimming to shore, he finds a disoriented and somewhat hypothermic Chekov already there. The ensign seems bemused, as if he is suffering from déjà vu. Worse, he has lost the maps he was making. Now he has to write them up again from memory. Yay. Further exploration of the caves ends in the discovery of the lost Team Three. But when the Enterprise tries to beam up both parties, the ship experiences an immense power loss. It takes everything Sulu and Scotty have to get the ship back into a safe orbit above Tlaoli. In fact, they end up throwing the ship away from the planet. When the transport Kirk and his people are expecting does not occur, they settle on trying to find another way out of the caverns. Research Team Three leads them to an “ice cave” which may have a back door out of the cavern system. When Kirk goes to help Chekov take a measurement of the cave for the new maps, he suddenly stops. “Do you hear that?” he asks the young ensign. Then, without warning, he and Chekov vanish from the cave. This leaves a startled Uhura in charge of the landing parties. As she gets them out, they discover some flame-like blue energy wafting around the ice cavern. It is only visible in the pitch dark. Unsure just what it is, but assuming it is some kind of transporter device, Uhura gets the team back to the cavern where they found the research team – and they find Chekov, totally unhurt but equally miserable. However, there is no sign of Kirk in the cave with him. Questioning him, Uhura and the others learn that Chekov remembers nothing but falling into the crevasse and its icy waters. He has no idea where the captain is and does not recognize anyone except the members of his own landing party, and them only by face, not by name. Eventually, the team makes it out of the caves and back to the base camp. Gambling that the power drain on the equipment here has not been terrible due to distance, they try to contact the Enterprise. Unknown to them, Sulu has already made two runs to Tlaoli’s surface to pick up the remaining researchers and bring them back to the ship in a cargo shuttle with a shielded engine. Also, on the way out of the caves, Chekov found human tracks and a handprint. This proves that someone – hopefully Captain Kirk – got out of the caves ahead of them. In hopes of attracting the captain’s attention and leading him back to the base camp, Uhura allows the two weapons officers in the group to set up a beacon. However, despite the distance, the equipment at the camp is losing power. Before Uhura can decide whether to shut down the beacon or keep it on, Sulu lands the cargo shuttle Drake at the camp, having found the location more easily thanks to the beacon. McCoy, who arrived with Sulu in the shuttle, spends the rest of the night operating on an injured member of the spelunking crew. Meanwhile Uhura, Sulu, and Chekov muse on how to find the captain. Uhura reluctantly lets Sulu take the shuttle back into the air to do aerial recon to find the captain, while Chekov and two others follow him on the ground. It does not take Sulu long to spot Kirk. He gives Chekov and the others his signal, only to disappear in a flash of light when his shuttle collides with the strange energy field that made Kirk and Chekov vanish. Uhura is horrified by this turn of events. But the geologists in the landing party figure that, if Kirk and Chekov are still on Tlaoli, and since they found Chekov in the caves, that is where Sulu will be. Where the shuttle went – well, that they will find out sooner or later. Uhura lets Chekov and his team search for the captain while she takes McCoy and Sanner back into the caves. There, they find Sulu in one of the pillars of rock in the cave – only to realize the pillar is a travertine-encased, alien healing device. But it is healing a Sulu who is twenty years older than the pilot they know! Elsewhere, hunting down the captain, Chekov gets a similar shock. He finds and corners, not a great starship commander, but a rebellious fourteen year old James Tiberius Kirk! Back in the caves, Sulu comes to and Uhura tries to get him to calm down. It takes a few minutes, but eventually Sulu realizes he is not only out of place, he is out of time. When they question him, McCoy, Sanner, and Uhura learn that in this Sulu’s timeline, the Gorn have invaded the galaxy and are on the verge of destroying the Federation. Sulu, Uhura, and Chekov were on a mission to stop the Gorn when the Tlaoli device picked the younger Sulu up to replace his older self. Trying to find out just when he is, Captain Sulu asks who the captain of the Enterprise is. In the process, he names Captain Kirk’s former first officer, Gary Mitchell, as a previous captain of the ship in his timeline. 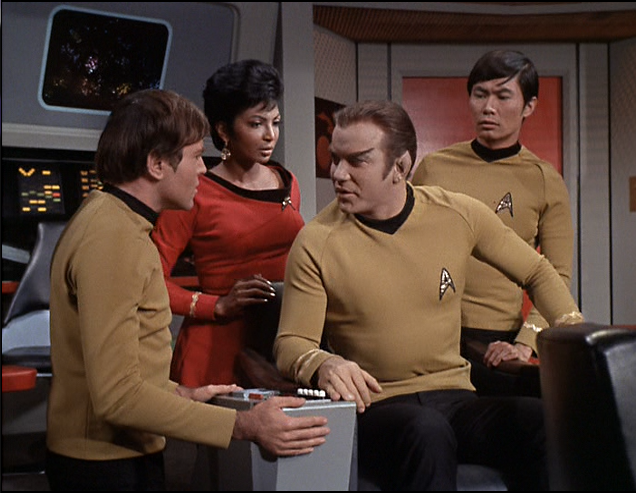 Uhura and McCoy share a blank look, then explain that Mitchell is dead and James Kirk is captain of the Enterprise. Now it is Sulu’s turn to give them a blank look, dropping the bombshell that he has never heard of a James Kirk commanding any ship in Starfleet. In fact, to the best of his knowledge, no such man ever existed. Well, now that I have basically spoiled the first book in the trilogy for you, readers, I will have to tell you to pick up the three volumes yourselves and allow you to take the adventure on your own. Suffice it to say that I greatly enjoy these books, as we get a look at how the three “lower level” Enterprise officers learn about the great friends they are going to become through their adventures in the original TV series. Temporal mechanics being what they are, we readers have the best chance of remembering the whole adventure. After all, since the trilogy is set in the first season of the original Star Trek series, L. A. Graf cannot go jumping around that much! Still, the trilogy is a fun sci-fi story and a grand illustration of Uhura’s, Sulu’s, and Chekov’s characters. I have to warn you, the ending for the trilogy, Past Prologue, is a heartbreaker. 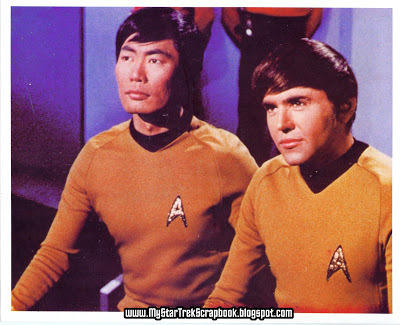 It is very, very hard to see what happens to the older versions of Sulu and Chekov at the end – but at the same time, it makes me so darn proud of the two of them! This entry was posted in Book Reviews and tagged Book Reviews, Captain James T. Kirk, Commander Spock, DeForest Kelley, Ensign Pavel Chekov, Future Imperfect, Gene Roddenberry, George Takei, James Doohan, Janus, Julia Ecklar, Karen Rose Cercone, L. A. Graf, Leonard Nimoy, Lieutenant Hikaru Sulu, Lieutenant Uhura, Marvel Comics, Melissa Crandall, Montgomery Scott, Moscow, Nichelle Nichols, Past Prologue, Present Tense, sci-fi, Science Fiction, Scotty, Star Trek, Star Trek The Original Series, The Janus Gate trilogy, trilogy, TV series, TV Shows, U.S.S. Enterprise, Walter Koenig, William Shatner on January 22, 2016 by The Mithril Guardian.